Fill your clean bowl with one bag of the impression powder and when you have your plastic bag to hand and your baby occupied pour in the specified amount of cold water and mix vigorously until you have the smooth paste with a slight sheen to it. 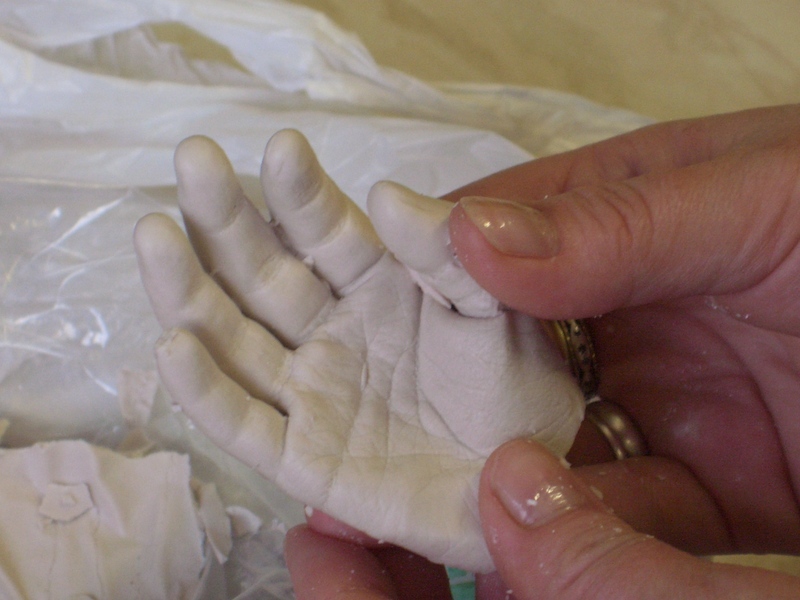 As you are doing this, have your helper splash a bit of warm water onto the foot or hand being used as this will make getting the mould off easier later on. 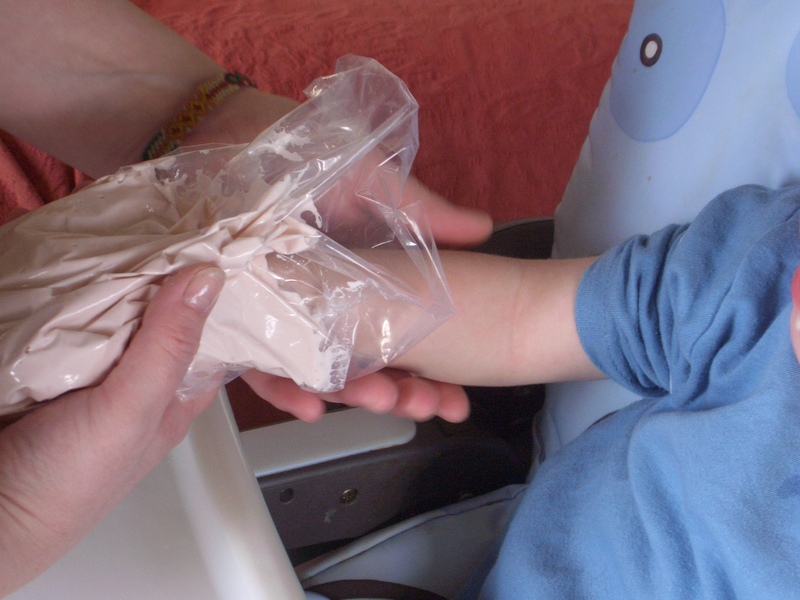 PLEASE REMEMBER THAT 1 ½ MINUTES IS REALLY ALL THE TIME YOU HAVE FROM MIXING TO GETTING ONTO THE LIMB, therefore, as quickly as you can, using the bag as a glove, scoop the mixture up and push the child’s hand or foot into it making sure you push and smooth the paste up and around the limb making sure that it come up to the lower ankle or wrist. The mixture must completely surround the limb, over the top, bottom and sides etc and make sure that no fingers or toes are poking out touching the bag. 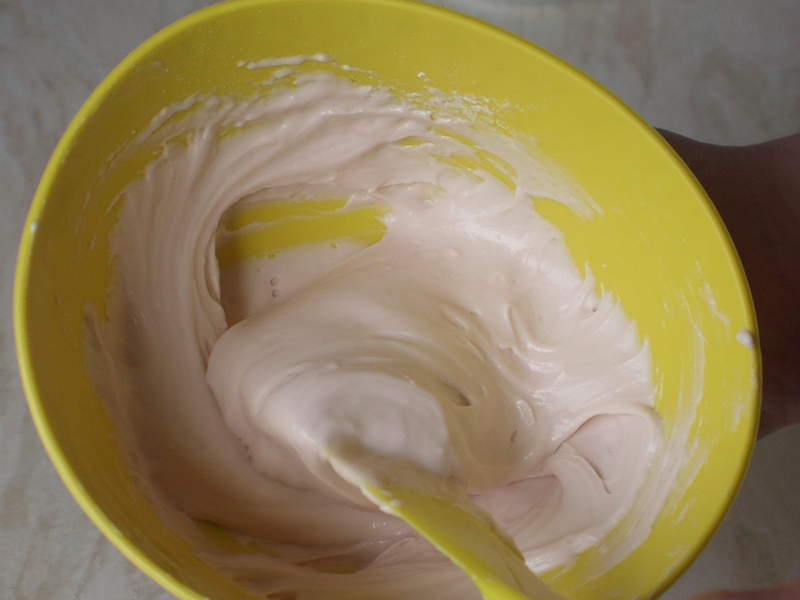 Your child will most likely wriggle a bit at this stage but don’t panic, just keep them distracted and keep pressing the mixture around the limb until the mould is set as that is the moment the impression is taken. 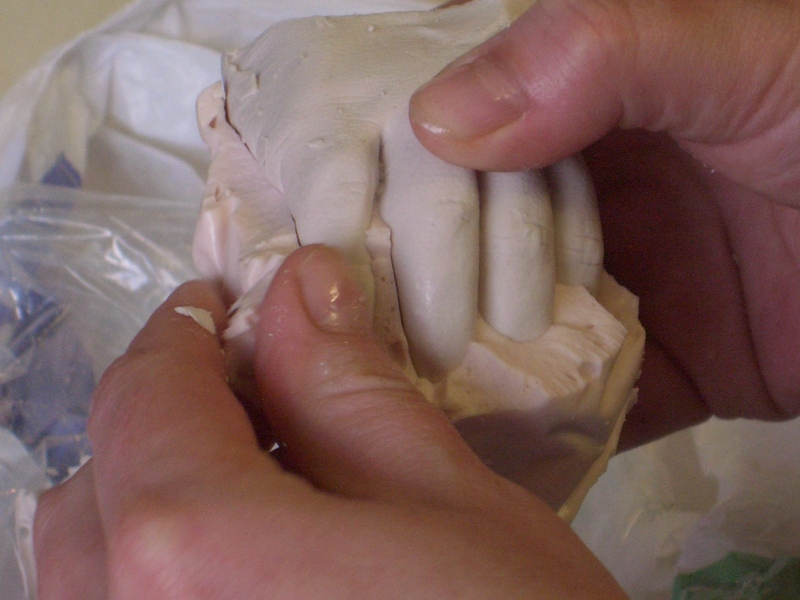 When the mould is set, wiggle the limb gently and remove from the mould. Please be aware that the mould will rip if too much twisting is done. Leave the mould as it is in the bag (rolled down) for casting. mould in a steady flow to about half way up. Tap the bottom and sides to get rid of any air bubbles then again with a steady flow fill the mould up to the top, repeat the tapping again. 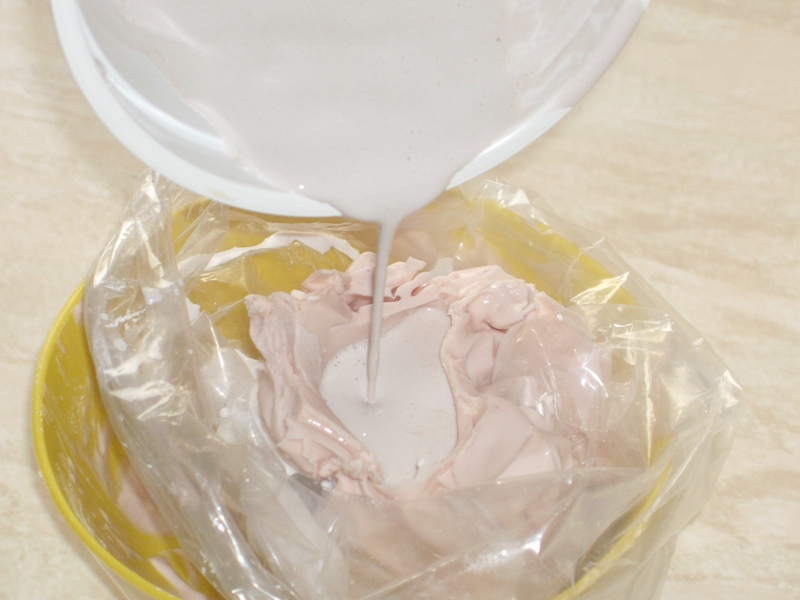 Leave the mould in a warm, dry area such as an airing cupboard for about an hour until the cast is set. 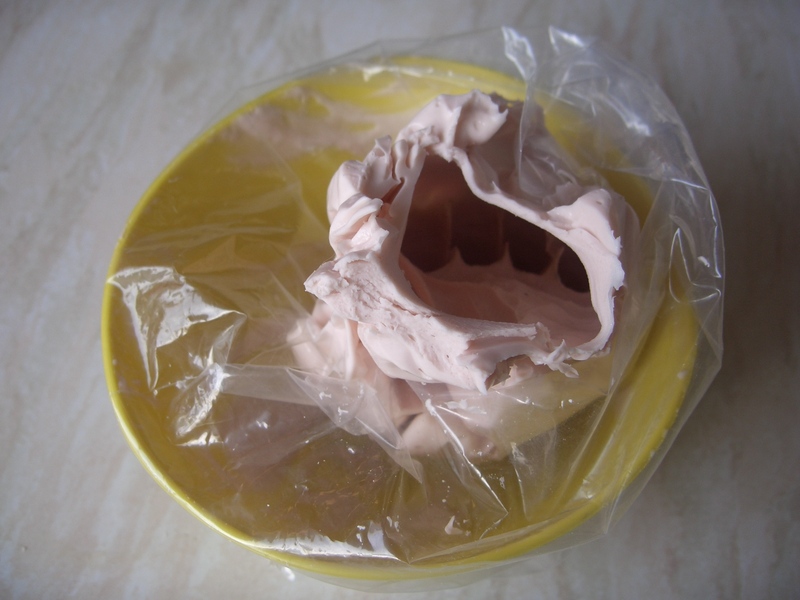 You can now start to remove the pink impression mould, very carefully and in small pieces starting around the ankle/wrist area and over the top and bottom. Leave the toes and fingers until last and be very careful not to snap any of them off as it is easily done! Whilst the mould is set but still damp it is easy to get rid of any bumps, using the cocktail sticks, just flick them off. If you do have any air bubbles they are easily filled with fine filler. Using a sharp knife, or rasp, level the surface of the cast so it stands without toppling over and has a flat enough base in which to stick to your frame. Make sure that it fits behind the glass of the frame, if not scrape off some more until it does. Scoring the bottom with the knife a few times will help adhesion to the frame. Now leave your cast for at least 48 hours, up to a week in your warm place to ensure it is completely dried out, it should have a ‘tinging’ sound when tapped with a ring. Once dry, choose which paint you would like to use and give it a stir and start with the first thin coat, brushing in the direction of any lines and creases. Once dry apply the second coat. Wash your paint brush out with water to re-use for the framing process. Sticking your cast to your frame couldn’t be easier – using glue, apply generously making sure you don’t go too near the edge and leave for a moment until the glue becomes tacky. Place your cast in your chosen position and hold it tightly for a while until it feels secure. It may be useful to use a cloth to hold the cast as if the glue gets on the cast from your fingers, it may pull the paint off. Leave to dry for 24 hours, screw on the back of the frame and attach the ring and plate for hanging.